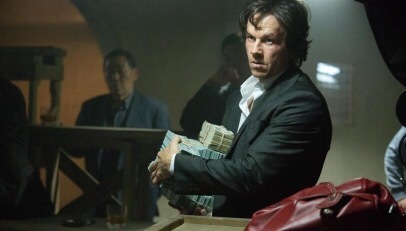 Mark Wahlberg’s fine and committed performance isn’t enough to save The Gambler – Rupert Wyatt’s remake of the 1970s crime drama – from being slight and dull. Literature professor and blackjack addict Jim Bennett (Wahlberg) is thousands of dollars in debt, turning to loan sharks for help after his wealthy mother (Jessica Lange) leaves him cold. But when he fails to pay back the loaned money, his position worsens further. There’s a sleek finish to The Gambler that makes it entertaining, but only at surface level. William Monahan’s script is flimsy, free of real drama and characters worth investing in (Lange disappears without a trace, while Brie Larson crops up as an object of Jim’s affection and nothing more). Not even Jim is fleshed out – merely a reckless man with nothing to lose and no moral compass whatsoever, which proves particularly difficult to stomach come the unfitting ending. Wahlberg, however, makes for an alluring lead and Wyatt’s polished direction ensures The Gambler is at least a handsome waste of time.